Do you have any plan to experience splendid palaces, marvellous architectural work, the terrain of bright colours and delicious foods? Don’t waste your time. Come to Rawla Narlai Heritage Resort, one of the best luxury hotels in India. We at Rawla Narlai Heritage Resort can ensure that it will be a perfect destination for you. Rawla Narlai one-time hunting lodge of Jodhpur Royal family has been restored meticulously and transformed into one the finest resorts in Rajasthan. 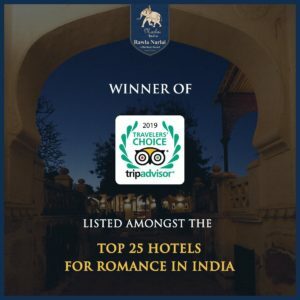 Behind the artistic archways and huge gates of Rajasthani culture, 25 restored rooms of the main fort have been furnished with modern facilities. One of the major attractions of Rawla Narlai is food. Rajasthani cuisine has an effect of Rajput Royal era and people have the choice for elaborate dishes with a great variety. Different types of chutneys made from various kinds of spices which are available in the local region like mint, coriander, garlic, and turmeric. Various kinds of sweets are also part of Rajasthani cuisine. As a Heritage restaurant, we offer a variety of delicacies according to Rajasthani cuisine. Here are given about some foods which are special. 1. Gatte Ki Sabzi: According to Rajasthani cuisine no fresh vegetables are uses for Gatte Ki Sabzi and this is the special thing of this dish. This curry involves steamed and lightly fried gram flour, tangy gravy prepared by tomato, spices, and buttermilk. You can enjoy this curry with roti or rice. 2. Laal Maans: This is considered as the Royal Food and one of the most famous foods of Rajasthani cuisine. The meaning of Laal Maans is red meat and due to its red colour, it is popular as Laal Maans. Traditionally, this food is prepared by deer or wild boar. Presently, it represents marinated and spicy mutton curry which is cooked using low heat including fiery red chilly sauces, sliced onion, garlic paste, and curds. 3. Ker sangria: It is one of the most popular Rajasthani dishes and it is prepared by Ker, one kind of wild berry which is peppery and tangy and sangria is one kind of long bean which is available in the desert region. 4. Dal Baati Churma: Baati is one kind of hard and unleavened bread cooked. Dal is prepared by the mixture of lentils and Churma, coarsely ground wheat crushed and then is cooked using ghee and sugar or jaggery. So, hurry up to allow your taste buds to achieve an exciting experience of Rajasthani cuisine including royal hospitality at our Rawla Narlai Heritage Resort.